Note to readers: +Thom Marion has added some comments to this post that are highly recommended reading for railfans and others interested in transportation or regional history. Click on "comments" at the end of this post & tell the browser to display them all. Your efforts will be greatly rewarded! Made by Dexter, West Nyack NY"
Permanence. As a child, I thought everything that was had always been and would always be. It takes a few years to realize that change is life's certificate of authenticity. The bustling railroad towns of Port Jervis and Middletown NY I knew in the 1950s are now just memories, personal experiences shared with fewer and fewer of my contemporaries. Sometimes as a consequence of community decline and occasionally due to changes in customer preference or competition, staid old landmark restaurants pass into history. Featured here are a few I have known and some I wish I had known. All have passed into history. and Water Street. Throughout its history, the Flo-Jean was both blessed and threatened by its riverside location. This restaurant had an excellent reputation for quality service and good food. In my mind, it never fully took advantage of the river views. On occasion, however, the Delaware became a bit too personal, depositing fresh fish and other aquatic life inside the building. Flo-Jean "Party Room, serving Dinners, Weddings and Banquets for all occasions." (source: post card published by Valence Color Publishers, Canadensis PA. Genuine Natural Color made by Dexter Press, Inc., West Nyack NY.") 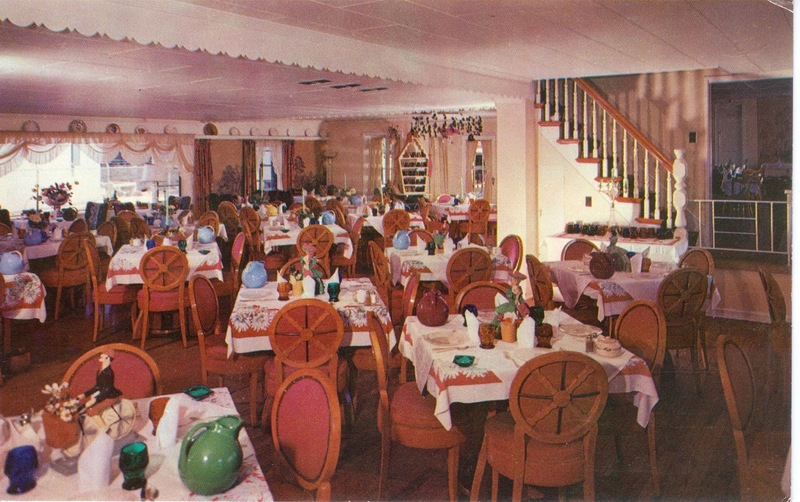 I don't remember which of the dining rooms my family ate in, but we always thought of the Flo-Jean as a special family place and favorite destination. 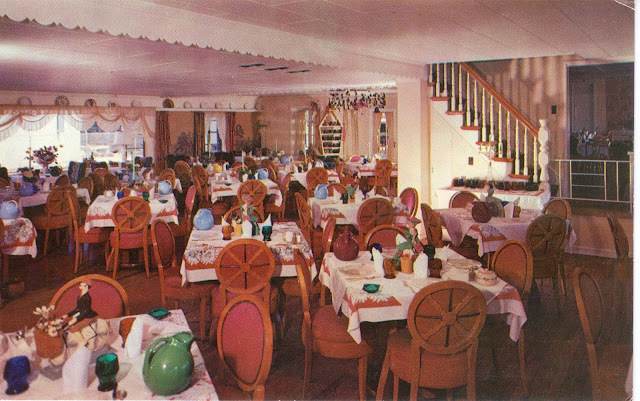 Note the green ash trays from the era when smoke-filled dining rooms were the rule. Outside of gas stations and library stacks, nobody had ever heard of non-smoking areas! "Once busy" describes the Port Jervis area very well. It was a canal town, then a railroad town and is now bypassed by intercity traffic altogether. At a time when all traffic passed over the Delaware at Port Jervis, the Flo-Jean prospered. Its prosperity continued through various owners during the time when the Erie Railroad's freight traffic was sorted out in the nearby yards. As detailed in the comments area below by +Thom Marion, the importance of Port Jervis as a transportation center declined. (Thom corrects my incorrect notion that the Lackawanna was favored over the Erie when the railroads merged and adds other interesting historical detail.) Interstate traffic that used to pass through town past the Flo-Jean took the new Route 84 bridge over the Delaware. In the 1960s, I boarded one of the last passenger trains from Binghamton through Port Jervis to my home in Middletown NY. Water Street, at the Flo-Jean's front door, shows the effects of this transportation shift. Vacant storefronts and detiorating facades are too common. Many buildings have been torn down, including most associated with the Erie Railroad operations. The contemporary picture is brightened by the rehabilitation of the Erie Depot, but the Flo-Jean's demolition was unavoidable. Operating a restaurant that nobody passes by anymore in a decaying, ramshackle complex of haphazardly connected individual buildings occasionally invaded by flood waters is too much of a challenge. From the Mid-Delaware bridge, this Street View shows the Delaware side of the rambling Flo-Jean complex, consisting of many "incorporations." The old toll house building is on the right. 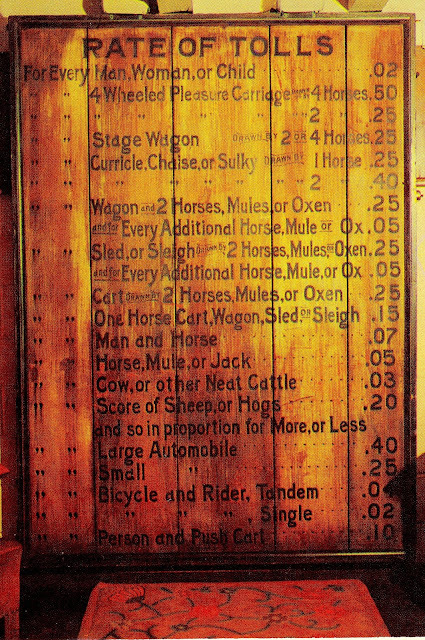 Tolls were collected by the Barrett Bridge Company until 1922. The Erie Hotel still welcomes patrons next door to the restored Erie Depot. Port Jervis is the northern terminus of Metro-North, which operates commuter service between there and New York City on the southern portion of the old Erie line. It's a long commute, but the Port Jervis area has many attractions as a bedroom community. Google Earth's Port Jervis with areas of interest highlighted. The Flo-Jean Restaurant is located at the top center of the Google Earth image above, with the old Erie station at lower left, the new Metro North station lower center and the former Erie roundhouse floor with turntable lower right. By far the best aerial photo of the restaurant I have found is https://ssl.panoramio.com/photo/127991564 (reproduced below) by Anuar T.
at the intersection of Pike & Water Streets. A few blocks east of the Flo-Jean, Pike Street tunnels under the remaining two of what used to be a dozen or so tracks of the old Erie Railroad on its way to the bridge over the Delaware where the Flo-Jean location at the Water Street intersection used to be prime commercial territory. Below are aspects of the Pike Street Tunnel as captured by Google Street View, and the skeleton of a similar underpass for Sleepy Hollow Road further north along the old Erie line. competition, trucking companies using free interstate highways, had an advantage. Today, the Pike Street freight yard underpass is as a deserted as a Roman ruin. As you can see in the picture above, it's been years since even graffiti artists paid any attention to the walls! Remnants of Erie days are imprinted all over Port Jervis. In the late 1950s, when my grandfather Diver's employer, the New York Ontario and Western railroad collapsed, leaving Middletown NY without one of its major employers, I used to envy Port Jervis residents, who still had a working railroad. I would never have imagined Port Jervis would suffer the same fate, but it's all part of the same process, national infrastructure collapse. The footprint of the old Erie roundhouse is clearly outlined in this Google Earth photo. As I understand it, the turntable still works. No. 833 at rest on the Erie turntable - October, 2015.
has great information on regional railroads. "...did save the Toll House sign displaying toll rates, guest books with comments going back to the 1930s, plus boxes of photos and news articles. She donated much to the Minisink [Valley] Historical Society, which will have an exhibit of Flo-Jean’s memorabilia...."
"Inspired by a fishing trip with novelist Zane Grey, General Motors executive Harold Dalrymple built Flo-Jean's El Patio Tea Shop in 1929, named for his wife, Florence, and her sister Jean." Port Jervis area by John Donnery.